In Agent ConsoleVirtual Contact Center's browser-based graphical user interface (GUI) used by Agents to manage customer interactions., agents can now receive web notification alerts for incoming interactions and avoid missing interactions when the application is not in focus. While in available state, if agents have moved away from the application temporarily, the web notification alerts them of incoming interactions. They can click on a notification to bring Agent Console back in focus to handle the interaction. 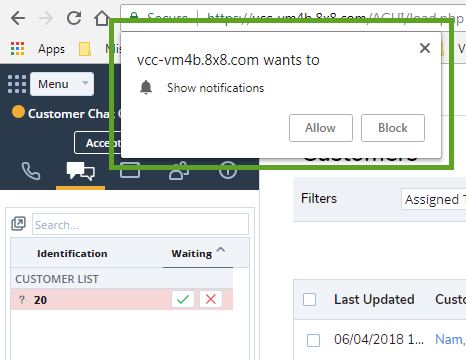 The first time an agent receives a new interaction, he is prompted to allow or block interaction notifications from the application domain. This prompt may vary from browser to browser and is required to avoid notification spam. If agents explicitly deny display of notifications but later change their mind, they must manually re-enable it in the browser preferences as the prompt is presented only once. Prior to Chrome version 37, the prompt is triggered by user actions such as mouse or keyboard events. Note: Chrome shows up to three notifications at a time; older notifications must be dismissed to give place for newer ones. All notifications can be read by clicking the Chrome notification icon in the system tray (Windows) or menu bar (Mac). The behavior varies with browser and OS combination. Each notification displays the interaction type in its title, and the customer name (if any) in its body. The agent can then click the notification to bring the Agent Console back in focus. This behavior may vary depending on the browser and OS used.